The visual culture of the early modern period has been a prominent theme here on the many-headed monster, what with Jonathan’s recent post on what God looked like, and my own series of posts on woodcut workers, so I thought another contribution to these musings would be welcome. So, below is an essay I was recently asked to write for a guidebook for an art exhibition being held at The Collection Museum, Lincoln. ‘Masterstrokes: Great Paintings from York Art Gallery’ runs until 26th August, and contains some of the highlights from York Art Gallery’s collection, on temporary display in Lincoln. What is a social historian? The main thing that marks us out from our colleagues in political or economic history is that we are concerned not so much with the ‘great men’ or macro-economic developments—which have undoubtedly played their part in shaping our past and present—but with the everyday lives and experiences of ordinary men and women. We want to know what life was like in the past for the majority of our ancestors. Recovering these experiences is far from straightforward. For the period that I study—the seventeenth century—the subjects of my research have rarely left behind any of their own accounts of what their lives were like. Only 30% of men, and 10% of women, were fully literate, and those that were tended to come from the upper ranks of society. As such, there are few letters or diaries surviving from humble men and women recording the fine details of their day-to-day trials and pleasures. As a result, the social historian needs to be ‘omnivorous’ in their search for useful sources of evidence. They need to cast their net wide and glean what they can from surviving court records such as witness statements, from surviving popular ballads and songs, or from the indirect evidence provided by the extant writings of elite social groups. They might also be able to gain insights from the visual culture of the period they study. In this regard, Dutch Golden Age paintings—such as Cornelis Bega’s ‘Tavern Scene’ on display here—are a tantalising prospect for the social historian. Many adopt a realist focus on the everyday life of seventeenth-century peasants and artisans. Moreover, many of them depict scenes of tavern culture, an aspect of everyday life that has increasingly come to attract the attention of social historians. There is a frustration here though for the historian of seventeenth-century England: there is no English equivalent in this century for the vibrant genre of everyday life paintings being produced in the Netherlands (I’m not quite sure why, but it is a common subject of speculation in conversation with my colleagues). 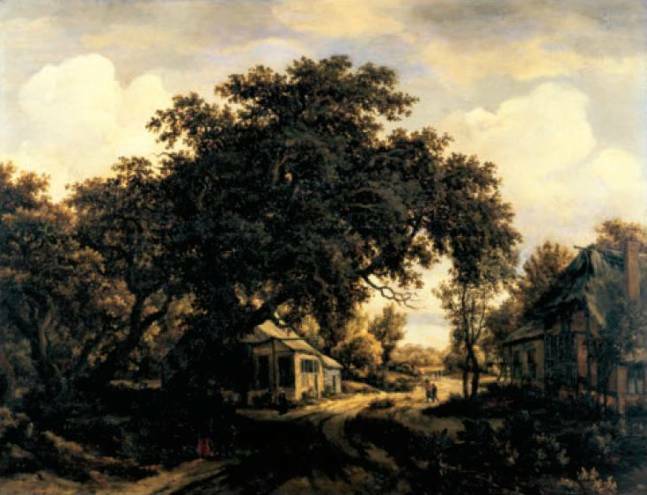 So there is an obvious problem inherent in trying to use paintings of Dutch tavern culture to draw conclusions about English tavern culture, but if we put that to one side for the moment we might think about what sorts of questions a social historian could ask of paintings such as Bega’s ‘Tavern Scene’. At first glance we might wonder if the utility of this painting lies more in what it tells us about contemporary attitudes towards tavern culture than what it can tell us about what actually took place in them from day to day. It could be taken to encapsulate a common negative stereotype of taverns that was most closely associated in England with Puritans—those who enthusiastically embraced the new Protestant religion—who were known to be particularly vociferous in condemning drunkenness as an ‘odious’ and ‘loathsome’ sin. Is the standing male character slightly off-balance perhaps, his shirt falling open as the decorum slips, drunkenly leering at the bosom of the… serving maid? 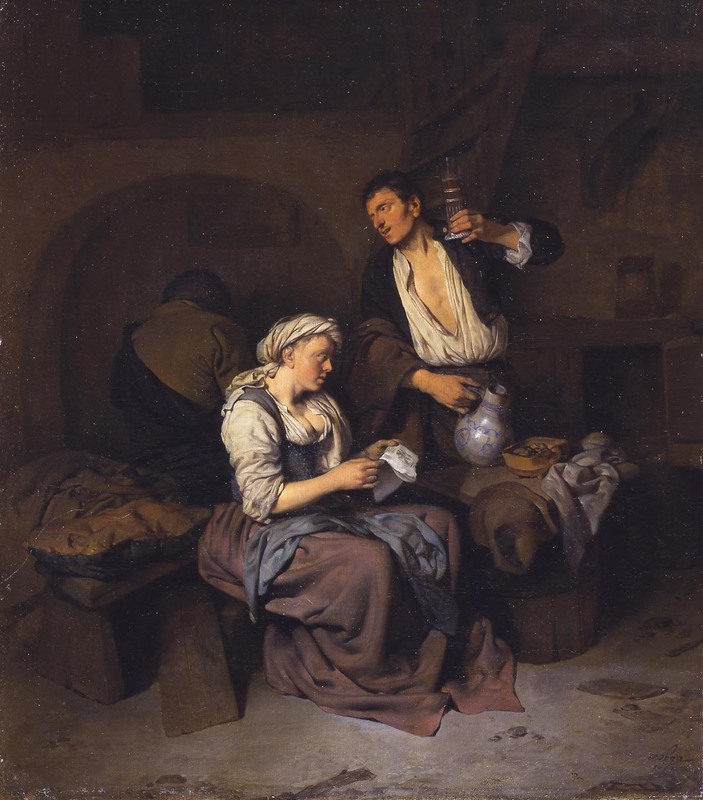 Taverns were often criticised as sites of inappropriate sexual promiscuity, and we could read this depiction as a visual equivalent to the many sermons that were preached against the immorality of tavern culture in the period. A closer look suggests that Bega is offering us much more than well-trodden moralising in his tavern scene. The social historian’s gaze is drawn to some of the more quotidian aspects in the painting. There seems, for instance, to be crumpled bedding laid out on the bench behind the central female character. This highlights an important fact about seventeenth-century taverns (or as they were more commonly called in England, alehouses) that the modern viewer may not appreciate: unlike the pubs of today, the primary purpose of an alehouse in this period was not to provide a location for recreational drinking. Rather, it had two main functions: one was to sell ale to local people who did not have the means to brew their own at home. Ale (usually weaker than our modern equivalent) was an important part of the daily diet and a key source of calories and nutrients, and was consumed with all meals by men, women and children. In this sense the alehouse was meant to serve more as an off-license. In practice, of course, many allowed drinking on site and they did become sites for recreational drinking and drunkenness, but this was forbidden in legislation. Their other (legitimate) purpose was to provide lodging to travellers. As such they were invariably situated on main roads, something we can see in another painting in this exhibition, Meindert Hobbema’s ‘A Wooded Landscape’. It looks like a drinking house on the left, identifiable by its ‘ale-post’, the ancestor of the pub sign, protruding into the road to show that ale was available. With this is mind another reading of this tavern scene is possible. What we have is not a scene of drunken debauchery, but a party of travellers who have spent the night asleep on the alebench (alehouse accommodation was rarely plush, and often involved simply sleeping on a bench or sharing a bed with landlord and landlady!) The man with his back to us is still rousing himself from sleep. The standing character is not yet fully dressed, but is nonetheless taking his ‘morning draught’ of ale, the seventeenth-century equivalent of that first cup of coffee. What we might be seeing is the depiction of a morning routine after an overnight stay at the tavern, a far from untypical experience in an age when the lower orders did most of their travelling on foot, and only limited distances could be covered in a day. We are also struck, of course, by the act of reading taking place at the centre of the scene. It is intriguing, given the statistics of female literacy, that it is the female character doing the reading. What is she reading? Could it be a broadside ballad? These were songs printed on a single (sometimes folded) sheet of paper that were sold cheaply—usually for a penny, the same price as a pint of ale—and often took the form of drinking songs to be sung in alehouses, or even pasted up on their walls. Is that one pasted up in the alcove on the back wall? Perhaps one discarded on the floor in the fore ground to the right? These drinking songs have received a lot of recent attention from social historians, who have mined them for insights they may offer into seventeenth-century tavern culture. Is this a depiction of one being performed? Is the standing male responding to a call that was common in these songs to raise a toast to his companions, or to raise a loyal toast to the King, another familiar feature of these songs? Arguably the scene is too sedate to be a raucous rendition of a drinking song. Another interpretation may be that the reader is relaying the latest news from a printed newsheet—possibly news of a successful sea battle that is spurring the toast of her companion, or even a satirical political broadside that is the root of his mirth. Both of these were common subjects for cheap printed wares that circulated in taverns. Indeed, the discussion of news and politics in taverns was common and widespread long before the emergence of the coffeehouse in both England and the Netherlands from the mid-seventeenth century, the drinking establishment which is more commonly associated with a public thirst for news and politics. Is Bega looking to capture the fact that the politics of ‘great men’ were not as detached from the world of everyday tavern culture as historians have often thought? It is, of course, beyond us to know for sure what Bega wanted us to take from his tavern scene, and at best it remains a somewhat indirect form of evidence of everyday life in the past for the social historian. That said, there are a number of aspects of his scene—the tavern as a place of lodging, the circulation of printed ware in these locations—that accord with the evidence of tavern culture in the seventeenth century that social historians have garnered from other sources. It reinforces our sense that tavern culture was about more than mindless drunkenness and sexual promiscuity, providing vital services and a venue for the dissemination and discussion of the issues of the day. Given these areas of overlap between Bega’s scene and what we can recover from other sources there may well be cause for optimism for social historians that such paintings can be a reliable guide to everyday life in the past. Or at the least, another component of our omnivorous diet of sources. 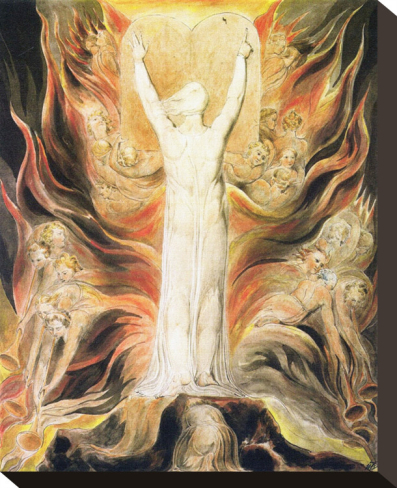 Idols of the mind; or, what on earth does God look like? People recognised this as a symbolic depiction of God, the newest element of a longstanding visual language which recognised that rays of light and prominent doves could function as representations of the holy spirit, and that indeed Christ could be represented as a lamb, or by the ‘holy monogram’ IHS and other Christograms. But people recognised the lamb and the holy name as symbols. They did not think that Christ was a sheep – the bible was rather insistent on the fact that he had been both God and man. So when people saw the tetragrammaton, or heard references to God’s voice, and feet, and fingers, what could they do but picture somebody in the form of a man, a man old enough to be the ‘father’ of the ‘son’ who had died for their sins? 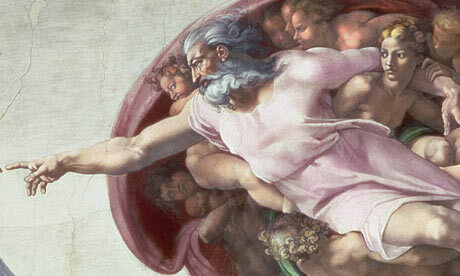 It is therefore easy to see an unresolved tension in the way in which most writers discussed the second commandment, with its absolute ban on images of the divine directly contradicted by the partial painting of a picture of God in words, through references to hands, feet, mouth, voice, and other physical elements of fleshy human bodies. that God hath anie hands: but that the holy scripture speaketh so by a resemblance as if it were saide, the lawe was note written or ingrauen by mans hand: but God approoued and ratified it by way of miracle. Not many people could maintain such a rigid division in their heads, however, and occasionally idols of the mind could be made partially manifest. I want to share just two examples today. 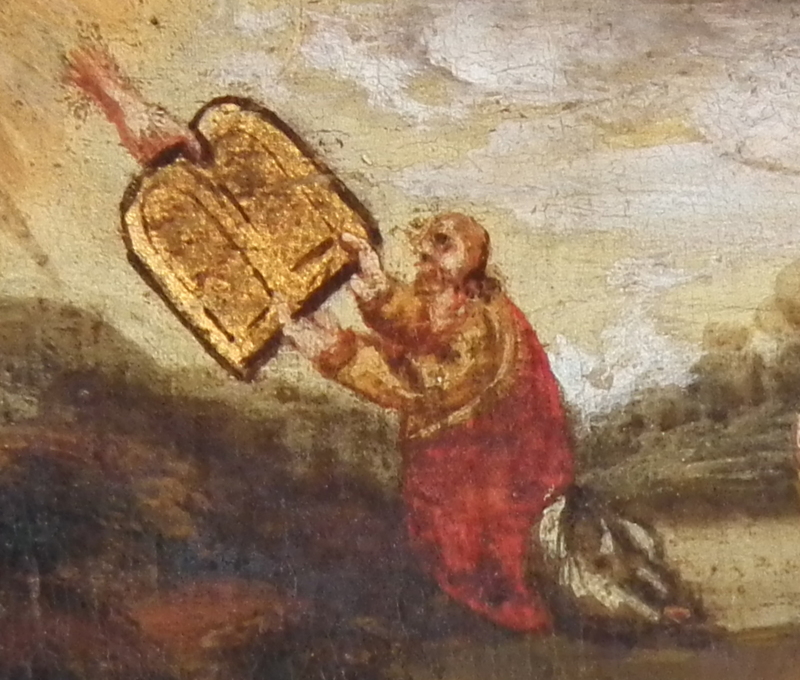 The first, taken from a rare Elizabethan commandment board hanging in a Hampshire church, shows what is unmistakeably a divine hand, fully formed with four celestial fingers and a god-like thumb, handing the ten commandments out of the sky to a kneeling Moses. 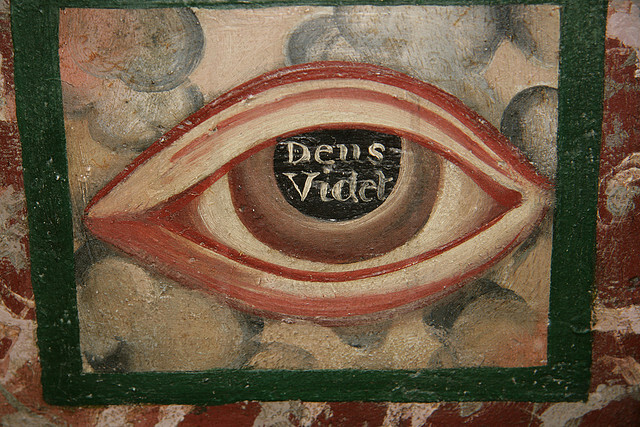 The second, knowledge of which I very gratefully owe to University of Birmingham PhD student Susan Orlik, is the baleful eye of God staring down at the occupants of an astonishing family pew in a Berkshire church, the pupil of which is inscribed with the words deus videt – God watches. If any monster readers have come across any interesting, unusual or incongruous representations or descriptions of, or references to, God, I’d be very interested to hear about them here! Samuel Purchas, Purchas his pilgrimage (1613), p. 17. John Brinsley, The fourth part of the true watch containing prayers and teares for the churches (1624), p. 78. Jean Calvin, The sermons of M. Iohn Caluin vpon the fifth booke of Moses called Deuteronomie, trans. Arthur Golding (1583), p. 391. Regular readers of the monster will no doubt be aware from the content of many of my posts that I am a historian of drinking. This may sound like a rather niche or unusual subject for a historian to study, but I am certainly not alone in my interest in the history of intoxication – in fact it is a major growth area, especially in early modern history, and you can now even get a job working specifically on ‘Intoxicants and Early Modernity: England c.1580-c.1740’ . Why are historians so interested in intoxicants then? Well, im portant changes in our relationship with intoxicating substances took place in the early modern period. 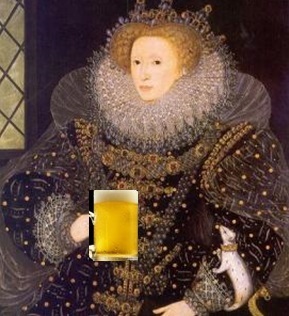 In 1550 English men and women had a limited choice of substances they could turn to for a ‘psychoactive’ experience: ale for the poor, wine for the rich. In contrast, by 1750 ale and wine were joined by beer, gin, tobacco, tea, coffee, and chocolate, all of which were being mass consumed across the social scale. This transformation in the range and quantity of intoxicants being ingested by the English population should not be seen simply as a footnote in our history: it was a historical development of wide-ranging significance that was intimately connected with major transformations in economics, politics, society and culture. Colonial expansion, the relationship between the state and the individual, gender roles and conventions, ideas about appropriate forms of behaviour or ‘manners’, class differences, and the role of public opinion in the political process, are all crucial aspects of English history in this period that cannot be understood without reference to the trade, regulation, and above all consumption, of intoxicants. Historians, including myself, are now arguing that we put intoxicants where they belong: at the centre of early modern English history. – Over at Early Modern Medicine, Jen Evans has been exploring the way people in the seventeenth-century thought about the health implications of new introductions such as coffee and tobacco, including some rather creative songs about the effect of tobacco on male virility. – The history of tobacco has also been taken up in a recent blog over at History Today, which provides a useful introduction to the emergence and development of smoking habits, and reveals the rather surprising fact that tobacco’s initial success owed much to its perceived medicinal properties. – And I also came across this interesting post recently which corrects a view I often get presented with: that people drank a lot of ale and beer in medieval and early modern England because they didn’t drink water, which was thought to be unsafe. According to Tim O’Neill, they did drink water – and ale and beer were more like an early version of energy drinks than an alternative to water. So, pick your poison, and expect to hear more about the history of intoxicants as this field of study continues to expand. For a flavour of the recent work in this field check out the following: Phil Withington, ‘Intoxicants and Society in Early Modern England’, Historical Journal (2011), Mark Hailwood, ‘Sociability, Work and Labouring Identity in Seventeenth-Century England’, Cultural and Social History 8:1 (2011), Alexandra Shepard, ‘Swil-bolls and tos-pots’: Drink Culture and Male Bonding in England, 1560–1640’ in Laura Gowing, Michael Hunter and Miri Rubin, eds., Love, Friendship and Faith in Europe, 1300–1800 (2005), and the essays in Adam Smyth (ed. ), A Pleasing Sinne: Drink and Conviviality in Seventeenth-century England (Cambridge, 2004).